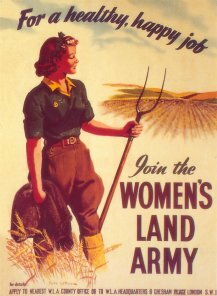 The Women's Land Army was re-formed in June 1939 in order to provide a mobile labour force of young women to replace the men who would increasingly be called into the armed forces from agriculture and horticulture during the Second World War, which began for Britain on 3 September 1939. The WLA continued after the war ended, in 1945, and was finally disbanded in November 1950. Over those eleven years some 203,000 Land Girls, as they were known, served on the farms and market gardens of England and Wales and proved to be vital in helping to produce food to feed the nation. There were also WLA organisations in Scotland, Northern Ireland and the Isle of Man. The Women's Timber Corps was a separate part of the WLA; formed in April 1942 and disbanded in April 1946, its 6000 "Lumber Jills" worked in forests and timber mills (4000 in England and Wales and 2000 in Scotland), employed by the Ministry of Supply. Despite the misleading term "Army", the WLA was a civilian organisation, an agency of the Ministry of Agriculture. Its "volunteers" were employed directly by either private farmers, from September 1939 onwards, or, from 1942, by County "War Ags" (War Agricultural Executive Committees) which housed them in hostels and transported them daily to those farms which needed labour locally, according to seasonal needs. The Land Girls were not subject to military discipline, even after they joined, from early 1942 onwards, under conscription, but were recruited and provided a distinctive uniform by WLA County headquarters. This gave them a sense of esprit de corps and marked them off clearly as essential war workers. 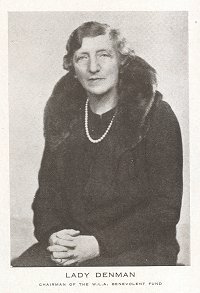 The Women's Land Army was created and directed by Lady Gertrude Denman, who had chaired the National Federation of Womens Institutes since 1917, and had an unparalleled network of contacts throughout the country. This, and her outstanding leadership qualities enabled her to quickly forge an effective national organisation based on county committees of volunteers and a core of paid officers and administrative staff. She provided her own large country house, Balcombe Place, near Haywards Heath in West Sussex as the Headquarters for the WLA. Some 17,000 volunteers had come forward at the outbreak of war and 1000 was sent immediately into service. By December, 1939, only 4500 had been found work. Their pay, initially, was 28 shillings a week, ten shilling a week less, on average, than male farm workers. By the end of 1943 the WLA had an active membership of over 80,000 Land Girls. These young women workers, many of them from towns and cities, and initially unused to both agriculture and country life, had to take on all areas of farming, despite only limited training. They proved themselves more than capable in what had previously been "mens work", whether in milking, animal husbandry, field work, pest control, tractor driving and all manner of hard physical work, throughout the country. 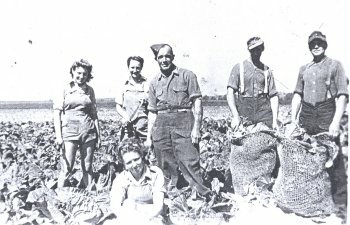 Increasingly during the war farmers were also assisted, in many areas, by Italian prisoners of war, and, later, by German POWs, who both helped swell the agricultural labour force. Land girls signed a pledge to commit themselves to the Land Army for the duration of the war but could leave if they married or wished to transfer to other war work. By the end of the war in 1945, numbers had dropped to 54,000 and many left to get married or return to their pre-war work. Prior to disbandment, in November 1950, membership was down to 8000.